The CL112 can be fine-tuned to perfectly fit whatever job you've got, being available in 6x4, 8x4 and 10x4 configurations for construction work, and 4x2 or 6x4 for distribution roles. 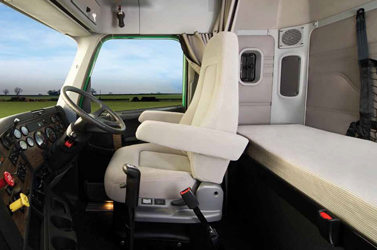 Add to that the option of a Day Cab or a 34" Mid-Roof Sleeper. Whether you're shifting concrete or shipping containers, the more you cart the more you make. 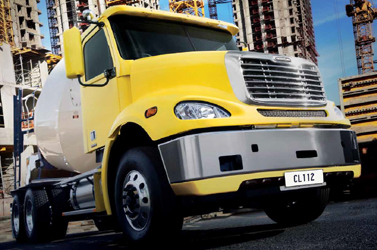 At Freightliner, our designers are obsessed with keeping our trucks light and that's never been more evident than with the CL112. Its incredibly low tare weight is possible thanks to a strong, safe and super-light, aluminium cab. Furthermore, the Columbia's set back front axle allows for ideal weight distribution. 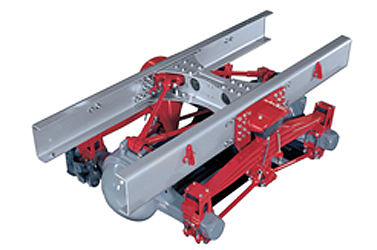 With the axle closer to the payload maximum weight capacity is achieved. Add those two vital factors together and it means more revenue per load which is exactly what you want. The truck should do the hard work, not the driver. Freightliner's CL112 provides drivers with a modern, comfortable and safe place to spend their time in either a Day Cab or 34" Mid-Roof Sleeper Cab. Three large and evenly spaced steps, convenient grab handles and a wide door opening provide confident access into the roomy cabin. A warning alarm will sound if the door is ever opened without the park brake being engaged. A Front Underrun Protection Device comes as standard. The giant two piece curved windscreen and low-set dash mean visibility is excellent from the driver's fully-adjustable EzyRider II air-suspended seat. The steering column can also be adjusted for tilt and distance to ensure the perfect fit. The durable and attractive two-tone dash is ergonomically-designed to keep all the controls in easy reach, including the CL112's generous air-conditioning system which is among the largest available. Of course, the Columbia's cabins boast plenty of insulation to protect drivers and passengers from external heat and noise. Locakable over-head cabinets, large door pockets and a multi-task console between the seats provide more than enough storage. A handy tool box sits beneath the passenger seat. Building sites and loading bays are notoriously tricky places to manoeuvre, unless you've got the Freightliner Columbia CL112. A generous wheel cut delivers an exceptionally tight turning circle, and excellent forward visibility is achieved thanks to the Columbia's sharp, 16 degree bonnet angle. Being able to see what's right in front of you not only prevents accidents, it gives drivers much greater peace-of-mind. 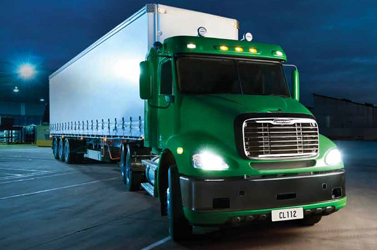 The CL112's large, remotely-controlled mirrors provide excellent rearward visibility. They can also be folded out of harm’s way, so you can get into and out of tighter spaces as well as save on repair costs. Good work tools can't be delicate, so the CL112 has been built for a life of rocks, mud and potholes - days of lashing rain, freezing starts and no let up. The truck comes standard with dual steering boxes for excellent feel and control, while heavy duty maintenance-free bushes on the front suspension reduce the bumps. 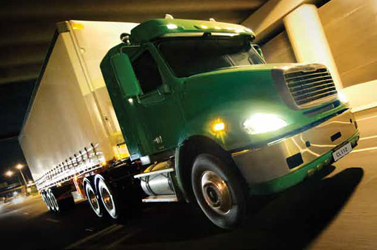 Proven and lightweight, Freightliner's AirLiner(TM) rear suspension provides one of the smoothest rides available and is maintenance free. Freightliner's TufTrac(TM) six-rod steel spring suspension is an option with the 6x4 and 8x4 configuration, to provide maximum off-road traction and ground clearance. Freightliner's E-rail technology allows safer and securer electrical routing to minimise chaffing and maximise durability.